Mani With a Touch of Bling! ﻿I seriously could not stop staring at this manicure! I'm mad at myself for doing it when I did though, because we painted the living room that night and this manicure was destroyed. I saw these decals a few weeks ago at Sally's on Clearance, so I figured I would give them a try. Hey, for $1.99, why not? Even full price they're $2.49. I'll just use one at a time, so they'll last me awhile. The bigger ones (for thumbs, etc.) I'll just cut down with nail scissors. So, what do you think, pretty, right? 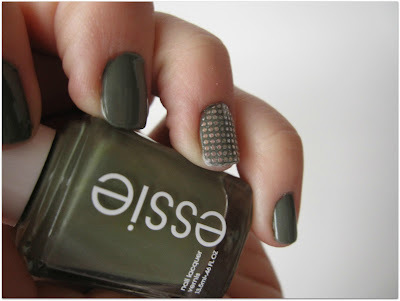 After looking at these pictures, I'm thinking of doing this manicure again! Ten Pound Tuesday: Exercise Accessorizing! A Turkey Reuben: A Rachel!